Almost without exception, the eight musicians in “Reflections on Diaspora” reigned in sonic magnificence. The Foundation for Chinese Performing Arts concert on Saturday in Jordan Hall served up a banquet for the eyes featuring nine different Chinese instruments and percussion. A cello, less the peg, also figured in. And, I began feeling more and more confident when the predominantly Chinese audience and I both had come up with the same favorites out of the ten contrasting pieces played on Saturday evening’s program. The opener summoned us to our toes. Mantra of Puan Qing Dynasty Palace was written by Aixinjueluo Yuhuan, a composer of traditional Chinese music, who was one of the few remaining descendants of the royal family of the Qing Dynasty. His music surely sounded old-style, vividly framing the regality of another time. Seven different instruments immaculately sounded out close unisons throughout the spellbinding pentatonically regulated melody. From the Puan Qing Dynasty to Shanxi folk music, Selling Vegetables was one of several of those standouts, a thriller, for both audience and this listener. Dizi, or transverse flute, and sheng, or mouth organ, wowed with dazzling birdlike piping over intriguing harmonies often coming punctuated in high-speed locomotion. A solo on the guzheng, or zither of plentiful strings and moveable bridges suggested to this Western ear the minor scale in play, one on which Bach and Beethoven depended. Here, the zither explored quasi new age arpeggios, lush flourishes, delicately plucked strokes, and backhanded slams. These techniques among others were present in Fang Dongquing’s Men of Letters: “immerse, stain, dissolve, splash and pour” musically described the act of calligraphy, the actions of which I was unable to decipher on first hearing. Timbral action, dramatic development, and a dose of modernity kept listeners enthralled. Running Streams, traditional music for guqin and xiao, matching smaller the zither and the mellow end-blown flute, fell short of the mark. An ongoing high degree of intensity from the guqin overshadowed the ripened softer tones produced by the xiao, making that instrument appear as though it had been relegated to background. Five Colors – Impromptu for Sheng solo by Hu Jianbing. Shoed the polyphonic possibilities of the Chinese mouth organ with its vertical pipes cast chordal wave after chordal wave. Crescendos and decrescendos may have aspired to speeding celestial railroads. Resembling the West’s Minimalist movement in esthetic and, to a lesser extent, technique, the repetitive yet directionless Five Colors ultimately dissatisfied. Another composition of Hu Jianbing, The Sound from Tianzhu, displayed the same penchant for hurricanes of notes—less than a CAT 1—all this despite a slow tempo. The pipa, or lute, and peg-less cello created an altogether enticing opening, which would become a refrain of sorts. Questions kept popping up in my mind about continuity and whether there was any formal design that might have been hidden from view. Pipa Language by Lin Hai and arranged by Hu Jianbing unfolded in exquisite orchestration involving different combinations of the pipa, guzheng, dizi, sheng, and cello. As with other entrees, Pipa Language was non-modulating, that is, the tonal center never changed. As to timbres at play, one of the best had to be the pipa leading with mellifluous line and the sheng accompanying with lush compact sonorities. Along the River During the Qingming Festival by Liu Weiguang for dizi and guzheng tended to sound as storytelling. A series of shifting moods in pentatonic mode puzzled. In The Orchids by Hu Jianbing, the guanzi, or cylindrical double reed, penetrated Jordan Hall’s large space, drawing a smaller than usual audience’s rapt attention. Dance moves had to be a part of this music that finely wove the sheng and cello around that oboe-like wind instrument. Lao Liu Ban closed this instructive and enjoyable adventure with Chinese music-making. Lao Liu Ban (Old Six Beats) is considered to be the mother piece of the “Eight Great Pieces” in the main repertoire coming from the region of Jiangnan. Following its intricate monophony colored by five silk and bamboo instruments and Chinese percussion seemed not much different an exercise as that of following the most intricate lines of Bach. Ecstatic precision unison playing interspersed with ravishing solos, one on erhu, or 2-stringed violin, could not have been topped as the closer. 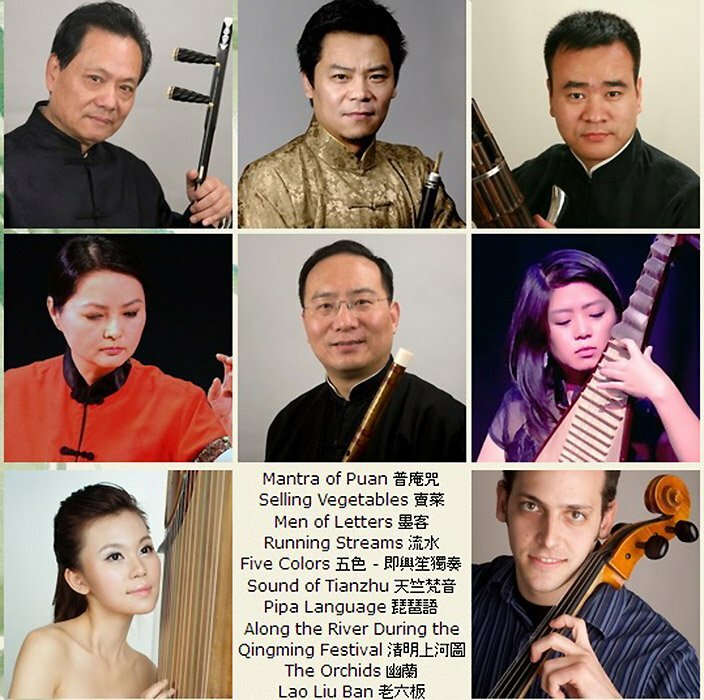 The performers were: Bao Jian, guanzi; Hu Jianbing, sheng; Chen Tao, dizi; Zhou Yi, pipa; Xia Wenjie, erhu; Weng Hui, guheng; Liu Li, zhougruan; and Mike Black, cello.